Since the last round (that was 2 weeks ago) I made apple cinnamon pork puree and sweet potatoes with cherry tomatoes and broccoli puree, I decided to make fruits puree this time. I went to my usual neighbourhood fruits store this morning and bought some persimmons, apples, carrots, avocados, blueberries and bananas. I must say it's not cheap to make fruits purchases nowadays. Persimmons are selling for RM1 per fruit and the blueberries are selling at RM9.80 per pack. Apples and the avocados are selling at 6 for RM10 and 3 for RM10 respectively. And they're not even organic. 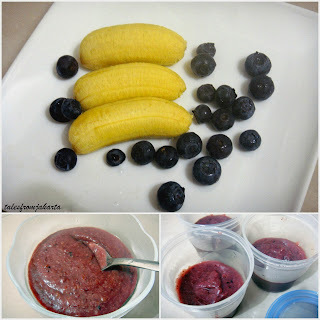 Since the avocados have yet to ripe, I can only make blueberries & bananas puree. It's one of the most simple baby food recipe around but be ready for a blue baby when it comes to feeding time. Wash the blueberries thoroughly. Discard any squishy or moldy ones. Steam the blueberries and bananas for 5 minutes or until the purple juices start to ooze out from the blueberries. Blend to a puree. If the puree seem to be too thick, stir in water / breast milk / formula milk till the desired consistency is achieved. Alternatively, if the puree is too watery, add in baby cereal or oats to thicken it. You may also choose to blend it a little coarser for older babies and toddlers. Scoop the puree into containers, depending on how much your baby eats per meal. Let it cool before storing into freezer. Important: Once food is thawed / heated, do not put it back into the freezer. Discard any leftovers.